Summary: Gone Girl meets Gossip Girl in Tatiana Boncompagni’s SOCIAL DEATH, a breathless thriller about the murder of a beautiful socialite and the scandalous secret she dies trying to reveal. Money and fame can conceal all manner of deceit, but only for so long. When veteran news producer Clyde Shaw is called to the scene of a grisly murder on the Upper East Side, she thinks it’s just another high-profile crime, the kind she’s built her high-powered career on—except the murder victim is Olivia Kravis, the daughter of Clyde’s boss, billionaire media mogul Charles Kravis, and Clyde’s best friend since childhood. As most of you know, I love mysteries. So when I read the description for SOCIAL DEATH by Tatiana Boncompagni, I was most definitely interested. I liked that the main character was a news producer and I hoped to get some insight into that career, while at the same time, being challenged by a good whodunnit. SOCIAL DEATH didn't disappoint. SOCIAL DEATH is a mystery featuring news producer Clyde Shaw. Clyde rushes to the scene of a murder on the Upper East Side only to discover that it's her long-time best friend, socialite Olivia Kravis, who is dead. To make things even mode complicated, Olivia is also the daughter of Clyde's boss, network owner and billionaire Charles Kravis. Clyde is certain she can work on this murder for the network without letting her personal feelings get in the way; however, she quickly learns that it's a more difficult balancing act than she ever knew. As Clyde tries to do her job and thereby increase ratings for the network, she also decides to start her own investigation into Olivia's death. What she learns about her friend and her own past puts her in danger and threatens to unravel everything she's ever thought about her own life! I enjoyed SOCIAL DEATH quite a bit. I liked the mystery as well as the characters, and I do think I got a unique glimpse into life at a major news network. The book was a quick read and did manage to keep me guessing. In addition, I was entertained by some of the lighter (and zanier) moments of the novel. One of the things that managed to make SOCIAL DEATH so enjoyable was the character of Clyde Shaw. Clyde was extremely interesting to me and I couldn't help but like her -- even though she did have quite a few issues. Clyde certainly was carrying some heavy baggage from her past; however, with the help of Olivia, she had turned the corner and straightened out her life (for the most part!) With the loss of Olivia, as well as uncovering some secrets about her past, Clyde was definitely on the brink of self-destruction for much of this novel. The story was told in Clyde's voice and I loved this choice by the author. Ms. Boncompagni managed to capture Clyde's personality from the first few pages, and I especially enjoyed her insight into the mystery itself and her personal failures. In addition, Clyde was very honest... at times brutally honest, and I appreciated her truthfulness about her struggles. Clyde is a complex character and one that has the potential to be very interesting as she moves forward in her career. The mystery itself was pretty well done. There were lots of secrets revealed and more than a few twists. I really didn't spend much time trying to figure out the clues. Rather, I just let myself enjoy the story. I was satisfied with the resolution of the crime, and I was even impressed with how the author followed up with how Clyde was affected by knowing the truth. If I'm being entirely honest, I kind of had an issue with the last few sentences of the novel. I don't want to give too much away, but there is a major shocker revealed that pretty much guarantees another Clyde Shaw novel. In one way, I liked being a little surprised, but I almost felt manipulated. (Does that make sense?) Having said that, I like the mystery that she threw out there and I look forward to seeing Clyde use her journalism skills to solve another crime. Overall, I enjoyed SOCIAL DEATH and recommend it to fans of light mysteries with female protagonists. 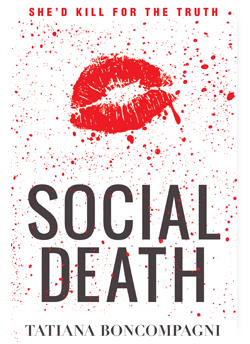 Giveaway alert: I have a copy of SOCIAL DEATH and a Votre Vu lipstick to share with one lucky reader. To enter, just fill out the form below before March 18th at 11:59 p.m. EST. I will randomly select and notify the winner the following day. This contest is open to those of you with U.S. addresses only. Good luck! To mark the release of SOCIAL DEATH, beauty company Votre Vu has created a red lipstick referencing the book’s title, setting, and graphic cover image. Votre Vu’s newest shade of lipstick—which will be released along with the book in March 2013 in limited edition packaging—is an incredibly wearable red that captures the book’s drama and sophistication. “Red lips have always been a symbol intrigue, glamour and seduction. In a nutshell, that is exactly what Social Death is about, and why I think this is such a perfect partnership,” says Boncompagni. This does sound like an exciting book! I don't mind sequels but endings that make it obvious there's going to be one does bother me at times. Great review. I just finished a book yesterday that had an ending like that, Half Bad by Sally Green. It's irritating. I probably would pick it up anyways without it being so obvious it leads into a sequel.